The rancher is paid by the feedlot, the feedlot is paid by the packing plant, the packing plant by the distributor, the distributor by the retailer, and the retailer by you. Everyone is trying to make a little money, but often times, someone loses. 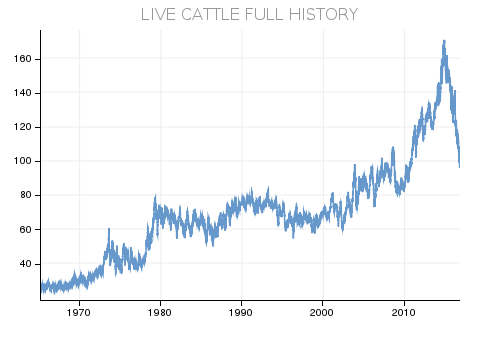 In 2014 and early 2015, cattle ranchers and feeders were making money hand over fist; drought, trade, and demand all played a role in the lowest cattle supply since the 1950s. Supply was low, demand was fairly constant, and the packing plants could either pay out the nose, or shut off the lights. Most, if not all, chose to pay out the nose. The cattle markets are naturally cyclical; highs never last, but neither do lows. The bull market (haaaaa!) lasted until November of 2015. 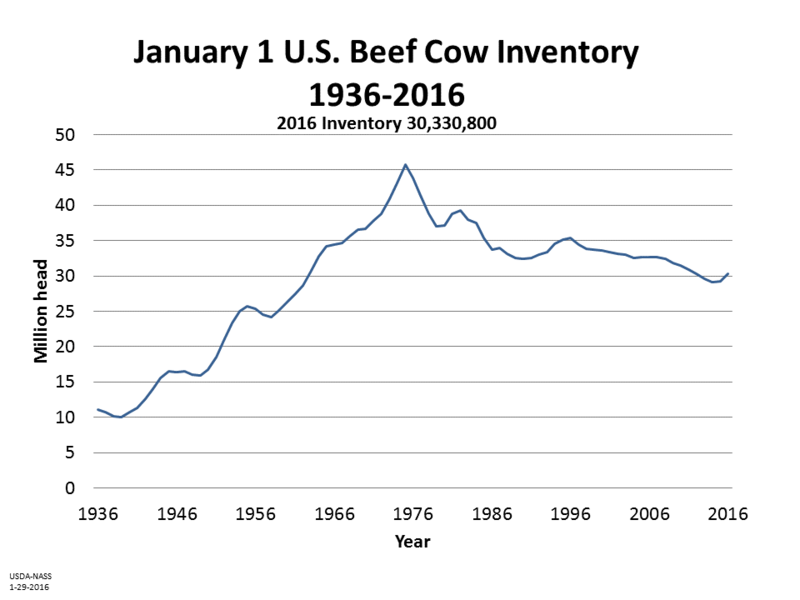 The cattle supply had recovered, and the markets were flooded with beef. Today, ranchers and feedlots are cringing as they sell their cattle for as much as 41% less per head to the next step in the supply chain. The y-axis above represents price per 100lbs of a live animal weight. Here's where it gets a little funny. You probably haven't noticed a commensurate decrease in the price of beef at your local supermarket. Sure, the price of ground beef has dropped a few cents/lb, but for the most part, the savings have not been passed along to you, the end consumer. Instead, the packing plants are making a little - and in some cases, a lot - more, the distributor's margins are higher, and the retailer knows that you - the end user - will continue to pay the prices you are used to paying, so they keep the savings back for themselves. Low cattle prices don't trickle up to the end user, and likewise, if America's beef-eaters are willing to pay more per pound at the supermarket, that doesn't trickle down to the rancher. Of course, this also is true when the markets are flipped - high cattle prices aren't proportionately reflected as high prices at the meat counter. In either case, there is a disconnect. At Honest Beef, we truly are in awe at the level of efficiency that the conventional beef supply chain has been able to achieve; it has allowed America to become a world-leader in beef production, and is what helps to keep the lights on at thousands of family farms and ranches across the country. At the same time, we are proud that we can tie you - our customers - so closely to the people that actually produce your food, and believe that this level of price transparency, not to mention product transparency (have we mentioned that you can see the pedigree of your Honest Beef cut, yet? ), is unparalleled in this industry.